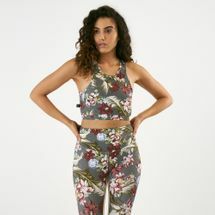 Work out and train hard with all the support you need in these stylish sports bras, that offer the technical functionality you need to maximise your workouts and change the way you train. What’s sport without support? From racerbacks to sporty straps, our range of women’s sports bras bring you exceptional quality and support with moisture-wicking technologies to keep you on par with your daily fitness regimes and mid-to-high impact workouts so that you can train like a pro anytime, anywhere. 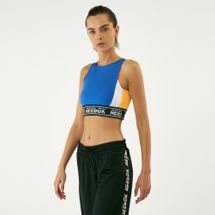 Whether you’re a sporty girl from Dubai, Abu Dhabi or anywhere in the UAE, you can get the latest in sportswear delivered right to your doorstep. Browse the latest range of sports bras and shop online with us today. The first commercially available sports bra was the ""Free Swing Tennis Bra"" introduced by Glamorise Foundations, Inc. in 1975. The first general exercise bra, initially called a ""jockbra"", was invented in 1977 by Lisa Lindahl and theater costume designer Polly Smith with the help of Smith's assistant, Hinda Schreiber. Sports bras can either encapsulate or compress the chest. Bras that encapsulate the chest have molded cups, while compression-type bras restrict movement by flattening the chest. 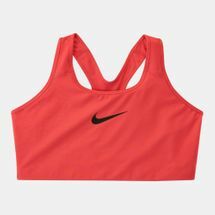 Encapsulation-type bras generally are more effective at reducing discomfort and sports companies have been introducing newer models to ensure that any discomfort is a thing of the past during your workout sessions. Buy your sports bras online with us today and have them delivered to your doorstep in Dubai, Abu Dhabi or anywhere else in UAE.